Seattle City Hall needs to negotiate, not fight, with industrial and maritime businesses opposed to the missing link. 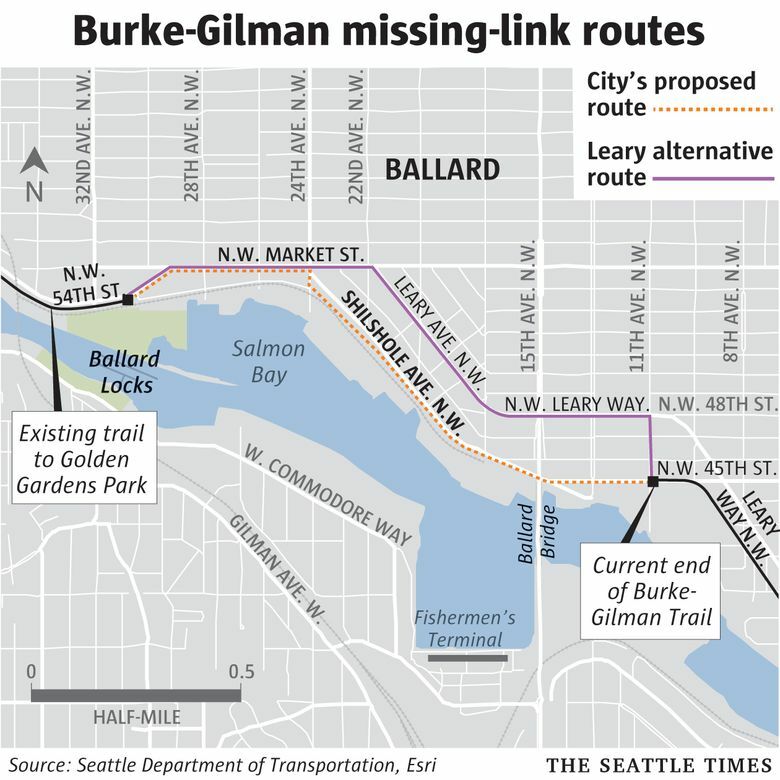 IF there was an easy fix for the missing link of the beloved Burke-Gilman Trail, it would already have been built. The 1.4-mile gap in the crown jewel of King County recreational trails leaves a confusing and unsafe blank space through Ballard to Golden Gardens beach. Since 2003, Seattle has stuck with a flawed missing-link fix which strings the trail through Ballard’s maritime and industrial sector. The businesses have rightly pushed back with a near-decade of litigation, winning again and again. No wonder Seattle Mayor Ed Murray and bike advocates were so eager to declare victory, as they did in February, with a deal that made it sound like the opponents were finally on board. Yet last Thursday, his administration finished a two-year, $2.5 million Environmental Impact Statement review of the project — by basically sticking with the status quo. In reality, this ends nothing. Dozens of industrial Ballard businesses along the route, as well as several unions, still say the city’s plan will push highly valued maritime jobs out of Seattle. The opponents give no hint they are giving up. And for good reason. It is well past time for Murray and a few rational minds on the City Council to fulfill their rhetoric about valuing the city’s unique maritime heritage and those valued blue-collar, middle-class jobs. Stop fighting the businesses. Negotiate a solution that closes the missing link without endangering Ballard’s working waterfront. The city’s longtime plan — a bleak, treeless trail along the waterfront side of Shilshole Avenue Northwest — intersects dozens of working driveways used by lumbering trucks servicing the Alaska fishing fleet and industrial businesses. Salmon Bay Sand and Gravel’s trucks alone cross the city’s preferred route 155 times a day, as the city’s review found. The city’s route would also run cheek-to-jowl with a railroad. Imagine toddlers on bikes confronting a fully loaded concrete truck pulling out a driveway. That scenario is why businesses have said, again and again, the city’s route endangers their future in Ballard and hundreds of union and family-wage jobs. Last week’s final review included one new bitter pill for Ballard businesses: The city’s route eliminates an astonishing 344 parking spots on Shilshole Avenue Northwest, which serve Ballard’s thriving food-and-drink scene. Construction costs of the city’s route are at least $12.5 million, not including likely right-of-way acquisition. After a decade-plus of debate and review, the total cost of the city’s missing-link plan is at $31 million — an eye-watering sum for just 1.4 miles of trail. To the credit of the maritime and industrial opponents, they unified — and even funded design of — an alternative: a protected bike lane up Leary Way Northwest to Northwest Market Street. It’s not perfect. But the route better separates freight and bikes, would put the path near retail businesses, not industrial ones, and provides more safety for those toddlers on bikes. The missing link needs to be filled. The question is how. The city has stuck for too long with a route loved by Seattle’s biking lobby but potentially disastrous for its historic maritime sector. It is well past time to compromise and finally build the missing link on the alternative path.